Kitchen splashbacks may not be the first thing you think about when designing a kitchen but they certainly have the power to change the whole feel of the space. Because splashbacks are easier and cheaper to change than a kitchen you don’t have the same pressure to choose a style that will endure 10 or 20 years so you can be a bit more bold with colour, materials and pattern. Tiles are a classic choice for splashbacks but current trends really favour vivid pattern and colour. Inspired by Morocco, vintage Victorian and Edwardian patterns and even 70s-style design, you can really set the tone of your kitchen with these bold statements. Glass is another popular material. You can use very vivid coloured glass to contrast to your kitchen or you can even have glass splashbacks with patterns or images printed or etched on for something a little different. You can even choose materials that you would not expect on a splashback by placing them behind glass such as wallpaper. You can create something different using standard materials but applied a little differently. 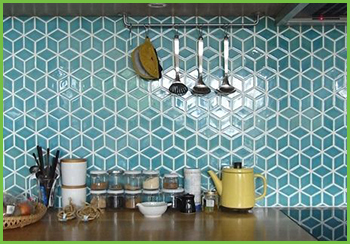 The way you place your tiles can create as much interest as the pattern and colour on them. Try placing them vertically instead of horizontally, create a geometric pattern with them or use tiles of different shapes other than squares and rectangles and don’t finish to a straight line. You can also use tiles that have different finishes or textures for a subtle look. To follow a theme through nicely you can choose another materials from elsewhere in the kitchen. Match to your worktops in timber, granite or veneer for a streamlined look. Match to your floor in timber, tiles or slate or even pick up the chrome from your handles with a stainless steel splashback. Don’t be limited by what’s in a kitchen showroom or think it’s a straight choice between glass and tiles. The only limit is your imagination; remember that even the most seemingly impractical materials can be made water resistant by placing them behind a sheet of glass. On our Pinterest board you’ll see materials as diverse as coins, wine corks, concrete and chalk boards. Don’t just think outside the box, think outside the kitchen! Materials that are more commonly found outside the house or elsewhere in the house can be used to great effect such as ply board, pebbles, tongue and groove panels, polished concrete and exposed brick work. When it comes to splashbacks, use the opportunity to create a feature and remember, the rules are there are no rules!! For help with designing your kitchen book a free design consultation by calling 0800 321 3491 or click here. 2 Responses to "Kitchen Splashback Ideas"